What a pleasant surprise this album is! I had never really heard of Steve Thorne before, but you can bet after this one I'll be keeping track on him. 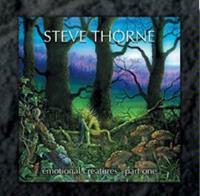 Thorne has produced a nearly perfect progressive rock disc here. The music on the album calls to mind early Genesis quite a bit, but there are other elements at play here - not all of them prog. In fact, I hear a healthy dosage of Cat Stevens on a number of the pieces. The thing is, though that there is not a single misstep on this release. It feels as if every piece of music, sound effect and vocal is right where it should be. Each song has the correct placement on the CD. Throne has also assembled a virtual prog army of guests here to help him complete the picture. Among the notables are Tony Levin, Geoff Downes, Nick D'Virgilio, and members of both IQ and Jadis. This is in many ways exactly the album that fans of mellow prog are always seeking. This may be Part One, but I know I will be anxiously awaiting further portions. Ballad-like in structure, this one seems a definite scathing tongue in cheek look at American society. It seems lyrically to be contrasting what the nation claims to stand for versus what it really is. Musically this is essentially an acoustic guitar driven, vaguely Celtic lilting little song. I'd say that I'd compare this to some of the protest music of the 1960's with a healthy dose of prog thrown into the mix. A tentative, rather spacey mellow prog approach begins this. As the vocals enter it is in a balladic style. They grow this one organically out into a traditional sort of progressive rock approach, but Thorne's vocals on the chorus remind me a lot Cat Stevens. This one is very tasty. It has a ton of emotion packed into it from both the vocal performance and the musical arrangement. I hear a bit of Fish era Marillion on this, too. Interestingly enough it really grooves. The first instrumental segment has a mellow jazz-rock approach. After the song proper ends this moves out into another instrumental mode that combines jazz textures with symphonic ones for great effect. This is the first real standout of the disc. In a fairly definite change up, this track feels like it could have been plucked from a Peter Gabriel era Genesis disc. It has all the elements of one of their more ballad-like numbers. This has a melancholy texture to it. It starts with a fairly stripped down arrangement but takes on more lush textures as it carries forward. This is another standout cut and is very beautiful. This turns slightly more hard rocking later, but still stays close to its roots until it drops back to atmospheric keys with mellow distant female vocals to eventually end. Starting on acoustic guitar this one seems at first to combine the sounds of Cat Stevens with that same early Genesis texture from the last number. As this one powers out I also hear quite a bit of Fish era Marillion interspersed. It's another winner with its powered up ballad approach. This one is very emotional and pretty. With a tale of drug addiction it's also bitter and sad. The track turns later into a smoking retro prog textured jam with elements of Yes brought to the table. I also hear some Keith Emerson on the keyboard solo. This one may have started balladic, but it certainly is not content to stay there. It does however drop back to that territory to eventually end. I really thought that the last couple songs were about as far towards the balladic early Genesis sound that you could get. Well, I was wrong. This one is even more reminiscent of that Gabriel era as it starts off. Even when it shifts up to more energetic music that element is still the predominate one. This is another pretty, but rather sad one. This one is extremely powerful in terms of its musical arrangement. They turn it around a corner later into a smoking funky sort of jam that is very strong. Non-lyrical vocals are woven over the top of this backdrop to good effect. Eventually spacey keys end this. A dark sort of mellow mode with spoken sound bites over the top start his off in dramatic fashion. They heavy this up a bit as sort of punctuation, but overall it is in much the same mode as the last couple songs. That said, it doesn't feel redundant. There is enough unique flavor mixed in to make it unique. As this becomes more lush later those Genesis textures (but this time the slightly more energetic version of them) come back. The growing here is pronounced, but also very organic. 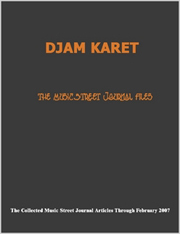 The arrangement becomes more full and powerful while still maintaining the basic musical themes. It also has a tendency to surprise by not taking the obvious turns. Atmospheric textures, with more of those spoken sound bites starts this tentatively. Tony Levin's presence is unmistakable as it enters to power up the backdrop here. At about 2 minutes in, this explodes out from the atmosphere into a very tasty rhythmically driven jam. It is funky and oh so cool! Theremin is added later for a cool effect. This instrumental is fun and a nice change of pace. It reminds me a lot of some of Levin's solo work. Acoustic guitar in a very folk oriented arrangement starts this. As the vocals and other layers enter those early Genesis elements come with them. After a time other instrumentation and layers are added to create a new dimension to this sound. This one doesn't have a lot of changes, instead gaining all of its diversity and power from revitalization and reworkings of its central themes. It drops to a percussion segment with more spoken soundbites over the top to end. Another with Tony Levin's signature all over it, this one is a fairly slow moving folk rock cut. This one again feels like a more progressive rock oriented interpretation of Cat Stevens' work to me. Still there are some of those Gabriel era Genesis textures here. This, of course, is just the first portion of the song. After the first set of vocals they power this out into the crunchiest music on the disc for an almost metallic take on the song's main themes. This runs through as the chorus, but they drop it back down for the verse and set off alternating between these two modes. Lyrically this one seems to address the problems of our violent society, but from a personal level. They drop it back to an acoustic driven, bluesy sort of jam that serves as the bridge. This has some great retro keyboard textures on it and eventually powers back out to a more full and rather heavy arrangement. Some soaring guitar lines enter later to take the cut to new heights. This part of the tune runs through, then eventually fades downward to end the track. What better way to end a disc is there than with a song entitled "Goodbye?" This one comes in as a folky ballad. It moves out into a more lush variation on its themes as it carries on. This also has a sad texture to it. It moves out into a new gentle segment later that feels a bit like Pink Floyd to me. That doesn't stay around for long, though, and gives way to the modes that preceded it. After the final chorus this changes into a more spacey take on the main musical themes. It moves forward through a number of changes with keyboards and distant vocals playing over the top. Then it drops to more atmospheric keyboards and sound effects to finally end. It makes for a very satisfying conclusion to the disc.